"You might even say it’s fun to listen to.” Rammstein's guitarists give GW an exclusive preview of their first studio album in a decade. Sparks are about to fly — literally. Pyrotechnic, melodic industrial metal veterans Rammstein are finishing up tracking for their seventh full-length studio album, the as-yet-untitled follow-up to 2009’s Liebe ist für alle da. With only mixing left to approve, the German band is aiming for a spring 2019 release and a tour to support the album. While Rammstein played five U.S. shows and one Canadian gig in 2017, they haven’t toured North America since mid-2012. The band members are excited to hit the States, yet they have mixed feelings about taking their flame-fueled spectacle — one that makes Kiss look like John Mayer — back out on the road. 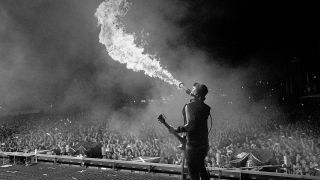 Because of the emphasis on drama and the dominance of pyro, some have accused Rammstein of being style over substance. But extinguish the flames and the band remains — after 25 years — one of the most inventive and successful industrial metal bands since prime-era Nine Inch Nails. A colossal and eclectic combination of palm muted metal riffs, operatic vocals, unnerving samples, gothic keys and pop hooks, Rammstein have crafted a catalog of martial metal that has kept fans coming back, and their upcoming album could be their most captivating to date. The band hasn’t released any new music yet, but there’s a bit of evidence to support Landers’ claim. During their 2017 shows, they played a song with the working title “Ramm4” that featured a shuffling electronic beat, carnivalesque guitar riffs and sustained chords that buzzed like bees drunk on pollen. And in mid-September the band flew to Minsk, Belarus, to record with a live orchestra and choir. More than anything, however, Rammstein want their newest studio album to sound less mechanical and more “human” than their past outings. Rammstein started working on their new record all the way back in 2015, entering the studio to record between tours. Mostly, Kruspe played his ESP RZK-1 signature guitar with Friedman heads and a Mesa/Boogie Rectifier and Landers used his ESP and Gibson signature guitars and his new Tech 21 PL1 Fly Rig pedal plugged directly into the board. Considering the contentious environment in which the band works, it’s amazing that Rammstein has retained the same lineup since 1994. Throughout the trials and tribulations, Landers, Kruspe and their bandmates — vocalist Till Lindemann, keyboardist Christian “Flake” Lorenz, bassist Oliver “Ollie” Riedel and drummer Cristoph “Doom” Schneider — have screamed and stormed out of hotel rooms and studios, yet they’ve always weathered the firestorm and patched up their differences.